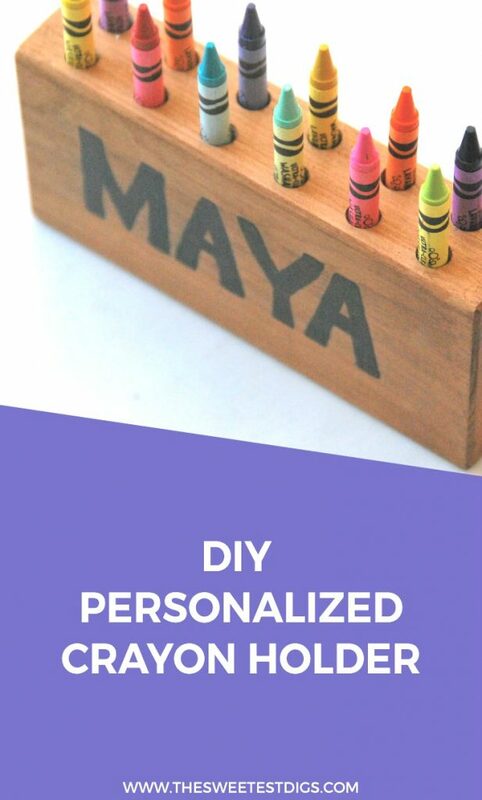 If you are looking for a cute way to house your kids crayon collection, or need a handmade gift idea, this DIY wood crayon holder is a perfect option. I made this one for my daughter for Christmas, and also made a few others at the same time for niece and nephew gifts. They were super easy and were a bit hit with the kids! Step 1 // Cut and Sand your Wood Block. 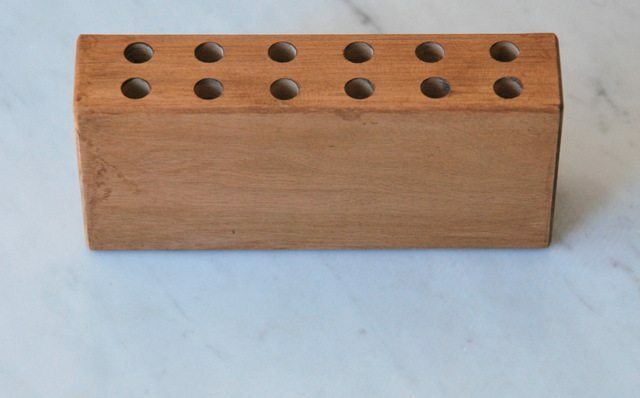 For these particular crayon holders, my Dad gave me a hand and cut the pieces out of cherry wood he had in his workshop, but you could use any 2×4 piece of wood from the hardware store (like pine – it’s really inexpensive!). 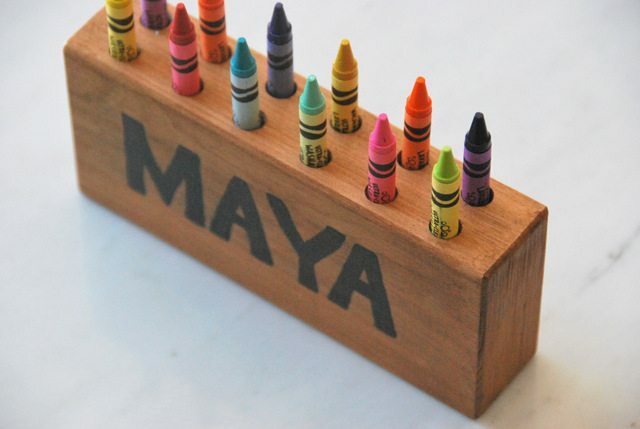 You want to cut your piece to roughly 8 inches wide, in order make enough holes for the crayons. So the block is 8 inches wide, 4 inches tall, and 2 inches deep. Make sense? Kinda like a brick shape. 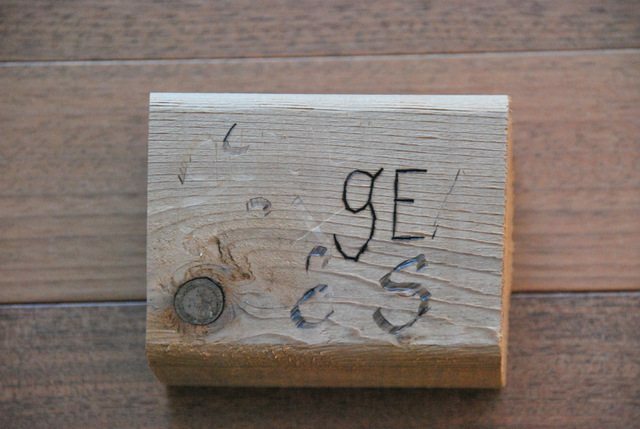 Once you have your piece of wood cut to size, sand it down quite well – on all sides and edges. Start with a low grit paper (like 6o or 80), and then work you way to the finer grit (300-ish). You really want to make sure it’s all smoothed out. Step 2 // Drill your Holes. Now onto the holes. We wanted it to be symmetrical and played around with different options. In the end, we thought it looked best to do two lines of five. 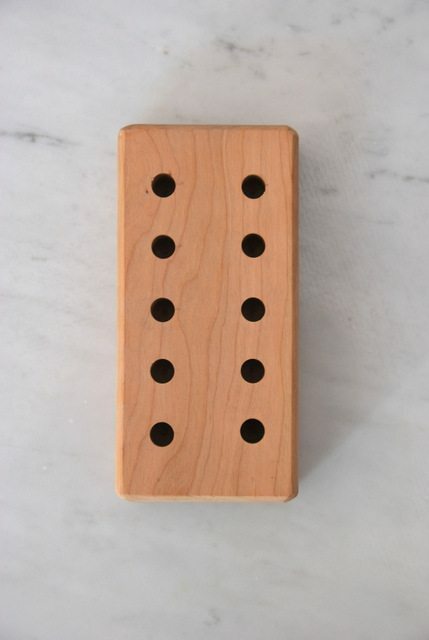 After you have measured where you want the holes to go and marked them out on your piece of wood, it’s time to drill. My Dad has a drill press in his workshop, so we used it with a Forstner drill bit. The size of the holes are 1 cm. 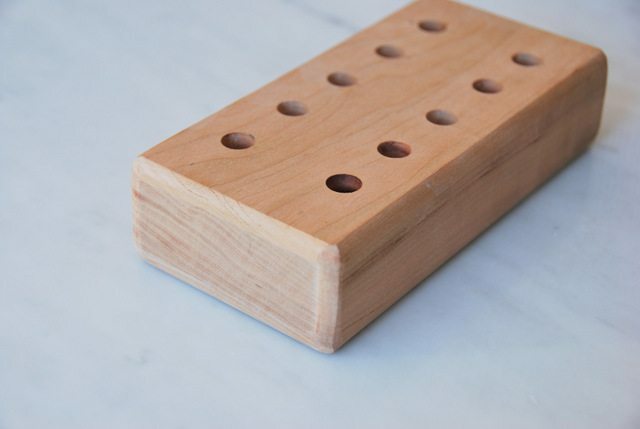 You could also make the holes with a regular drill, but take your time to do them accurately (the nice thing about a drill press is that it always comes down perfectly vertically and cuts the hole in a more sharp way). If using a regular drill, put a piece of tape on your drill to know when to pull it back up and out – that way you get the same depth of hole every time. Also, be sure to drill the right size of hole for whatever you are planning to put in your holder. You might want to adjust the size of the holes if you’re going to be making the holder for something like paintbrushes, or markers, etc. This block below was one we experimented with. We found doing the holes on that side made them too short to hold the crayons. That was when we flipped the block up onto the other side and drilled the holes on the more narrow edge. Next up was to stain the wood. I tried out some Minwax stain clothes for the first time. Have you seen them*? They come in a package and already have stain applied, so you just take a cloth out and rub it onto your wood surface. After trying them out with these blocks, I would say that the clothes are great but for bigger projects. 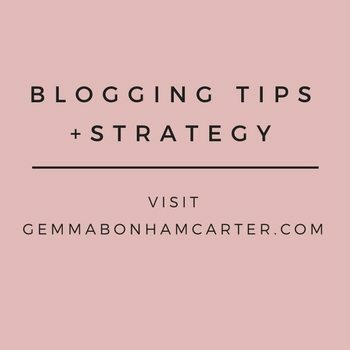 I found that they were really soaked with stain and it was actually too much for these smaller blocks – it ended up being a bit blotchy and messy (good thing I was wearing gloves!!). Nonetheless, the blocks still came out looking pretty cute! Time to personalize your holders. I drew out the letters with a pencil beforehand to make sure I spaced them properly (I inevitably always don’t get the spacing right to begin with!). Then painted the letters in this black acrylic paint* (my fave brand!) with a fine paintbrush like these ones*. 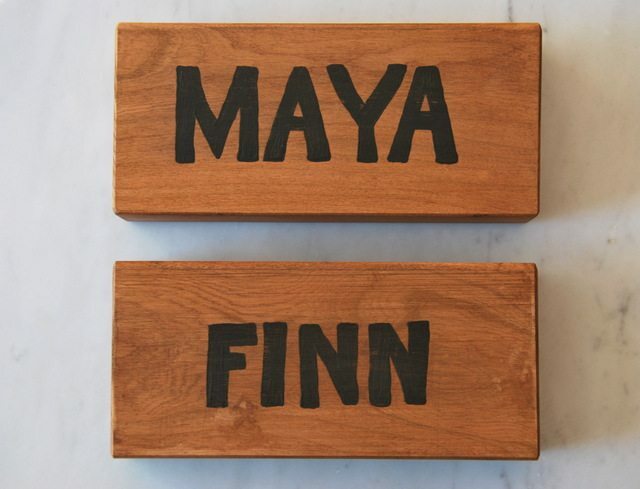 I took a really light grit sand paper to the names after they had dried just to make them look a little more “aged”. Stick some crayons in them, and there you go! Cute, right? Maya is obsessed with dumping the crayons out, then putting them all back in again. So I guess it’s not *just* a crayon holder but also a skills development activity for kids too?! Ha. Win! And for full transparency, here are a few failed attempts. I experimented with a few different things that didn’t quite work out. I also tried out a black sharpie. It wasn’t bad, but it did bleed a little bit. 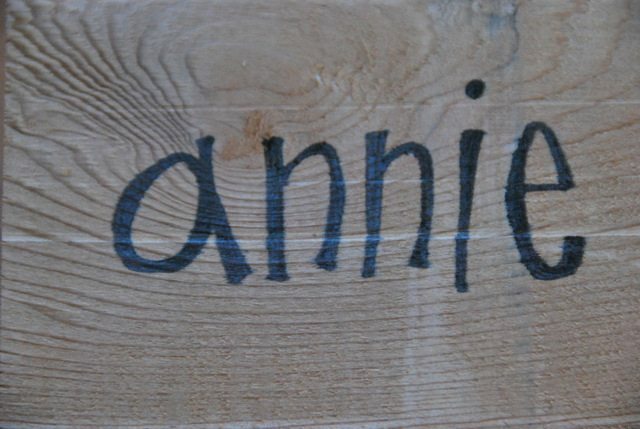 See how the lines aren’t super crisp – especially on the ‘e’ in Annie? I actually think though that doing the sharpie would’ve been fine after applying the stain. I don’t think it would bleed as much once the stain had penetrated the wood. 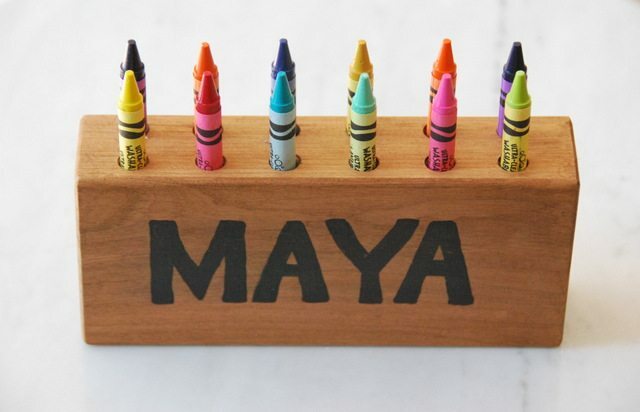 I’m sure this crayon holder will be a fixture on Maya’s desk for many years to come. Got any favourite handmade gift ideas? I’m all ears! 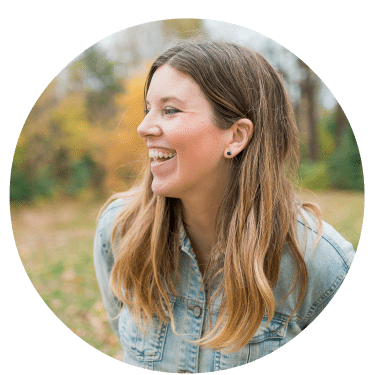 For a whole bunch more handmade gift ideas, head on over to the DIY Project Gallery! There are also lots of other kids project ideas – like this embroidery hoop art, that I did in Maya’s room. Cute, hey? What a lovely personalized gift. Great to get kids organized. This is so sweet! I can see how Maya would love it. Well that turned out really good, what a great idea too! I want one with my name!! haha WOW! So very cute!!! I tried wood burning over the holidays, and I just couldn’t get it to look nice. LOVE how you painted the names, they look really good! I love this!!! My kids would have a great time arranging crayons in it. Awesome idea, we actually have a birthday party today, I think I might whip one of these together! You should!! 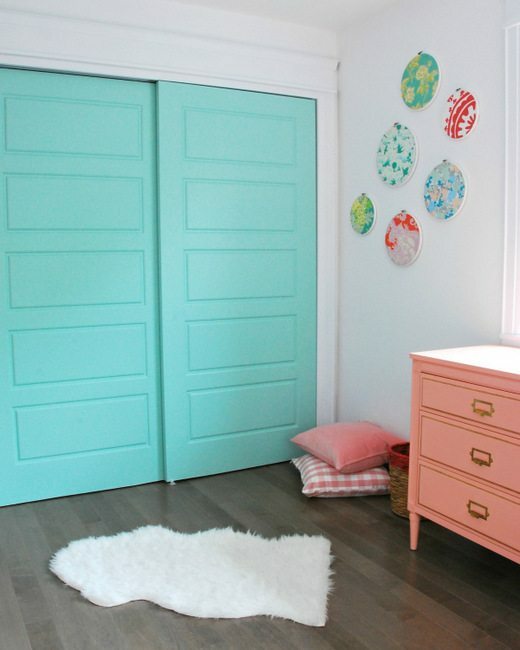 They really are very easy and look SO darling with the crayons in them. Thanks!! It has been a huge hit and the crayons actually go back into the holder (whereas they *never* went back into the box! ha! ).